arthur jones was an innovator and defintely not a guy to be trifled with, his appearance on david letterman was classic you could see the fear in letterman's eyes from some of the things jones said. AJ was a true "man's man"
I know you've got the inside scoop somewhere in your knowledge bank. How did Mentzer TRULY train during his formative years? 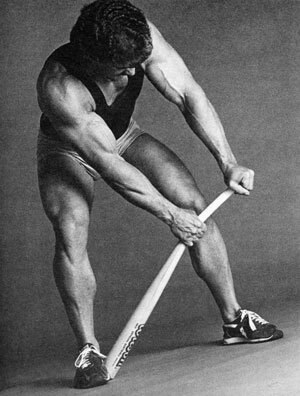 So many people dispute that he used his HIT methods, insisting instead that he relied on more conventional - some even claim "hypertrophy-specific" - training. from what i understand he was more into volume early on in his career and switched to HIT after he met and talked to art jones.he was good friends with david mastoriss from boston mass who also claims to have switched over to HIT or nautulis type training, only actually met mentzer once in allentown no less, he was from harrisburg area.d-mass is still around. also mentzer never counted his warmup sets in the plan he might have done 2-5 warm up sets but only counted 1or 2 heavy to failure sets as his workout sets. Funny. I've honestly heard the same thing about Dorian, too. It was in FLEX or MMI back around the late-90's. I forget who wrote the article. more d-mass. youngest guy to enter mr america ifbb version 15. Dayton was also a martial artist and put on demonstrations of strength; although, some were a bit "gimmicky." Yes Dave had great genes and was one of the first HIT trainees. Not Dave he was short. never saw him in person but remember him from his tv appearances, he used to break police handcuffs, explode a basketball hang himself as you pic'd, he always wanted to jump off the golden gate bridge but was never allowed, he eventually jumped off a lesser known bridge and broke his leg, his sister laura worked for one of the muscle mags back then. but not as short as dave, actually saw him in person at a contest in allentown the mr eastern america won by robert reis. zane guest posed at the show.